DWELLING ON THE DARKSIDE, WE REVISIT MONDO GENERATOR IN THE FORM OF NICK OLIVERI’S DEATH ACOUSTIC! The cover of the CD filled with the mellow (?) side of Nick Oliveri and his acoustic interpretations of Queens Of The Stone Age, Mondo Generator and Oliveri standards. With a title like ‘Death Acoustic’, I am not sure how mellow these versions will be! Cover photo courtesy Impedance Records. It has been said that I am a forgiving soul. Just recently I extended a journalistic olive branch to Todd Rundgren via my Facebook page Free Progressive (https://www.facebook.com/groups/FreeProgressive/) as I am not one to hold undeserved grudges. I have been known to give people second chances that most assuredly didn’t deserve a first chance. 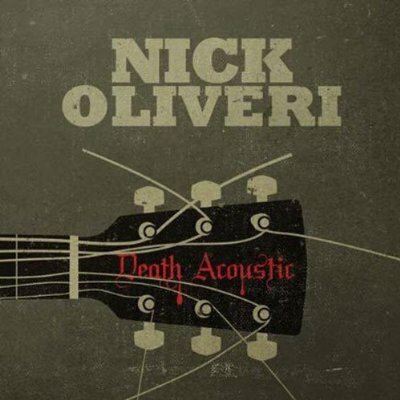 So on the heels of Mondo Generator’s last, less-than-stellar release Hell Comes To Your Heart, we take into account Nick Oliveri’s solo effort Death Acoustic. I have high hopes as, you really can’t bury a vocal if, in fact, this disc is only an acoustic guitar and voice. You are currently browsing the BouleBlog blog archives for January, 2013.